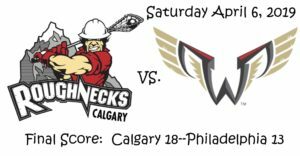 The Calgary Roughnecks were looking to bounce back on the road after losing last weekend on home turf 16-9 to the San Diego Seals. The Roughnecks looked flat against the Seals who led into the first quarter break 4-3 and kept the pressure on to overpower the home team in regulation time. Last Saturday was a different story. Calgary headed out on the road to the Wells Fargo Center in Philadelphia for their first and only meeting this season, and would put one in the win column in a high scoring game: Final Score: Calgary 18—Philadelphia 13. The Roughnecks have clinched a play-off berth, but Philadelphia would need to win the last four games in order to get into the playoffs. The Roughnecks would shut out the Wings in the first while scoring five. Rhys Duch (2g, 4a) opened it up scoring on a deceptive shot, showing he was going low and switched to an overhand laser to the top shelf stick side on Wings net minder. Dane Dobbie (4g, 7a) would get the second and last in the frame; and Riley Loewen (2g, 2a) scored twice with his second surprising Wings goalie Doug Buchan on the power play, making it 4-0. As a result Wings bench boss made the decision to give Buchan a break by putting Gowah Abrams between the pipes to end the first quarter. He’d get a warm welcome from Dobbie as he sent a shot into the cage with 1:03 remaining. Score at the end of one: Calgary 5—Philadelphia 0. Philadelphia would outscore Calgary 3-2 in the second. Josh Currier, brother of Calgary’s defender Zach Currier would beat his defender to dive across the crease beating Del Bianco post to post. Calgary would challenge the goal and after further review the goal was denied because the ball had not crossed the line before the shot clock expired. Wings captain Kiel Matisz (2g, 5a) would score back to back goals closing the gap to 5-3. Philadelphia would score three in under a minute and a half. The Roughnecks would stop the run as an untouched Roughneck on the transition, Greg Harnett (1g) would take advantage of the opportunity scoring his first goal of the season. Rounding off the second quarter Calgary defender Tyler Burton (1g) would get his second of the year. Score at the end of the first half: Calgary 7—Philadelphia 3. Christian Del Bianco made 26 saves on 29 shots in the first half. “You look up at the scoreboard and you’re up by five with the shots heavily favouring them, that’s why we love Delbs so much. He’s our backbone,” Malawsky said. Early into the third, transition man Anthony Kalinich (1g) would get his first goal of the season on the feed to mid-floor from Calgary’s goaltender Del Bianco. Philadelphia would put up a fight scoring three in a row as the clock clicked down in the third. Scoring four in the third for the Wings was Josh Currier (5g, 1a); and Frank Brown (1g, 2a) scored a short hander for the Wings ninth as he beat Calgary defenders Dobbie and Dickson early in the fourth. Calgary’s success started with Del Bianco between the pipes ending the night with two assists and the momentum soon moved forward swinging the ball around the attack. Rounding out the Riggers scoring Dane Dobbie ended the night with four goals and seven assists; Curtis Dickson increased his stats with four goals and six assists; and Rhys Duch had two goals and four assists. Wings 5’10”, 230lbs faceoff/transition man Trevor Baptiste ended with a solid performance on the night winning 29-36 draws; and Josh Currier with six goals and one assist. Calgary (8-8) returns home to the Saddledome to host the Georgia Swarm (12-4) on Friday April 12 for a rescheduled game due to the Flames hosting and NHL playoff game on Saturday, game time 9:30 p.m. EST. Philadelphia (3-12) will be on the road for two, the first on Saturday April 13 in Saskatoon to face the Rush (8-6), game time 9:30 p.m. EST; and the second on Sunday April 12 in Vancouver to face the Warriors (4-11), game time 6:00 p.m. EST.